According to ancient Greek mythology, Poseidon was one of the twelve gods who lived in Mount Olympus. Each of the Gods had their own speciality, and Poseidon was the God of the sea, horses, and earthquakes. In this game, you will enter the realm of Poseidon where the game is fun and the wins are huge! 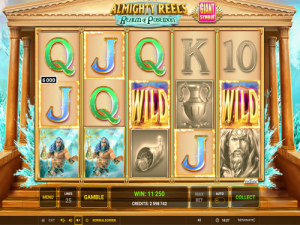 Almighty Reels Realm of Poseidon is quite a unique Novomatic game. Most of the elements of the game, such as the features and the rules, are pretty standard. But the design is quite unique! There’s an autoplay function in this slot game and there’s a gamble game, too – which is very normal for a Novomatic game! Almighty Reels Realm of Poseidon has a Free Games feature with a special Giant Symbol bonus! Giant symbols can also appear in the normal game. The Parthenon stands behind the reels, swirling in a humongous wave that must be at least 30 feet tall! Almighty Reels Realm of Poseidon has 5 reels and 25 paylines. It also comes with Wild symbols and Scatter symbols! It’s not the best slot game for beginners but it’s a great game for those who like to play: Haul of Hades, Lord of the Ocean, Mighty Trident and Dragon’s Wild Fire. Enter the Realm of Poseidon to see the symbols on these Almighty Reels! There’s a wonderful mix of traditional slot-style symbols as well as some symbols based on the theme of Ancient Greece. The traditional slot symbols are the symbols that show high card values: the 10, Jack, Queen, King and Ace. These are coloured and designed in a simple font. The King and Ace pay up to 2x your bet. The golden shell filled with pomegranate seeds and the golden lyre pay out slightly more. The golden vase is even more valuable! The ancient Greek warrior’s helmet pays out more and Poseidon himself is the highest-paying symbol on these reels. He’s no myth in this game! He pays out up to 4x your bet! At least three identical symbols are needed to get a payout. There are 25 paylines in total that run from left to right across the reels. For the slot to pay you a win, the identical symbols will need to fall on the reels, following one of the paylines, on adjacent reels starting from the leftmost reel. The more symbols you spin, the bigger the payout. Higher-value symbols have bigger payouts and payouts increase relative to your bet. All of the settings can be found, and changed, at the bottom of the screen. Everything is not as it seems in the Realm of Poseidon! Some symbols are normal but some are very special indeed! There are some symbols with special powers and some symbols with special growing powers! The Wild symbol is a golden Parthenon symbol and this can substitute for any other symbol in the game, except for the Scatter symbol. This is true in the normal game and in the Free Games. During the normal game, too, any of the ordinary symbols can turn into Giant symbols! Giant symbols, in Almighty Reels Realm of Poseidon, cover 9 positions (3x3) on the reels. When they land in view, they count as however many symbol positions they are covering. For example, if a Giant Ace symbol landed in full-view, it would count as if 9x Ace symbols had landed in those positions. These Giant symbols only land on reels 2, 3 and 4. The Scatter symbol is also a unique symbol. This symbol depicts an ancient Greek golden coin. This is also a Giant symbol (3x3) and if it lands in full-view on the reels (i.e. covering entirely reels 2, 3 and 4), it will award Free Games! When you land the Scatter symbol in the right position on the Almighty Reels, you’ll get 10 Free Games! Before these Free Games begin, the slot will randomly select one of the ordinary symbols to become the Giant symbol throughout them. Only the symbol chosen will turn up on the reels as a Giant symbol and the possibilities are only the themed picture symbols, not the card value symbols. This will appear on the reels quite often during the Free Games and if the game selects a high-paying one, such as Poseidon or the helmet, you could win a lot of money during the Free Games!